Bishop Guertin senior RB/DB Jackson Housman has become the latest local talent to commit to play for the UNH Wildcats football program. Housman was a play maker on both sides of the ball as well as special teams at BG, but says he plans on play on the defensive side of the ball at safety for UNH. 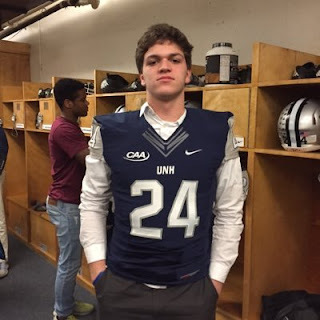 "I knew that I wanted to play at the Division 1 level, I really enjoyed my official visit and loved everything about the campus and the kids on the team" Housman told the NH Notebook. "I know that Coach Mac and the entire UNH football coaching staff will make me the best football player I can possibly be, and that is the goal for me." Housman is 6-foot-1, 2015 lbs. He's a tough kid with good speed and tenacity. He was one of the fiercest, hardest hitting defenders in NH high school football. He becomes the third member of this year's BG football team to commit to play Division I college football. The others are WR Nick Lorden (joining Housman at UNH) and linebacker/safety Chase Hughes (committed to Wyoming). "I love the game of football and love being on that field" said Housman. "So that is what I do and work for. I also had a great group of kids with me at Bishop Guertin that helped me along the way to be the best I can be. We were always working out together and pushing each other. Coach Moore was also a big help for me and others from BG going on to play college football like Nick Lorden, Keenan Dwyer, and Chase Hughes."